The truth is a little less puzzling and, according to my sources, it’s part of a deliberate stitch up to ensure the seat is given to Charles Barwell, the Vice President of the National Conservative Convention. As long ago as last summer, Barwell was tipped for the post and suddenly started appearing at local party gatherings. More than one PPC told me he was in line for the job. To make assurance doubly sure, I am told CCHQ "accidentally" forgot to advertise the Bromsgrove vacancy to all approved candidates before Christmas. In January, CCHQ told the Bromsgrove association that, as a result of its own "mistake", it was now too late for a fully open selection process. The local triumvirate which runs Bromsgrove Tories went along with this – though many other members in the constituency are furious they haven't been given a fair choice of successor to Julie Kirkbride. The net result is a shortlist with only one "local" candidate – Mr Barwell. Not only were Bromsgrove’s local members denied any involvement in short-listing their candidates, they have now been told to brace themselves for a five-hour selection meeting on February 6. It was intended that the members would only discover who the candidates were when they actually turned up. No doubt it was one of Mr Isaby’s CCHQ chums who spilt the beans. Either way, the local high-ups are most put out by this apparent outbreak of openness. Bromsgrove Tories have a tradition of secrecy and cabals to uphold and they are doing their best despite the difficulties. Take, for instance, the plan for the selection meeting itself. It’s starting at 10am, participants have been told to bring their own refreshments (not even a cup of coffee is on offer, even at 50p for party funds) and that they cannot go again until the whole thing is over. This is calculated to keep the annoying interference of the association’s 400 or so members to a bare minimum. The members are not happy. But who cares about that? No doubt the few far-sighted leaders of this association who will sit out the selection meeting to the bitter end will do as they’re told by CCHQ and engineer the selection of Mr Barwell. Separately, another West Midlands seat, where the UK Independence Party is a serious challenge, has managed to select someone who has in the past campaigned to abolish the pound and replace it with the euro. Presumably John Maples, at least, is pleased with this. If only someone had told us at the outbreak of the Iraq invasion what we know now, we'd have been so much more prepared for the illegal war we were taken into. All they needed to say was: Bush speaks only to Blair and Blair speaks only to God. It's amusing to hear three unbelievable things before breakfast. So I had to chuckle when a trio of bizarre rumours reached me at the same time. The first was that the Labour MP for Birmingham Edgbaston, Gisela Stewart, was planning to defect to the Tories. Gisela was a member of the body that drew up the European constitution. Even she was appalled by the monster she helped to create and has been opposed to it ever since. She will lose her seat at the election and it's possible David Cameron might find her a cosy berth somewhere else. But that's unlikely. Isn't it? Then I heard Cameron plans to install Ken Clarke, not George Osborne, as his first Chancellor. The thinking goes that Ken can take all the tough decisions and handle all the flak for a couple of years while his past experience will reassure the markets. Then when the economic storm has died down a little, Ken can go to the Lords and George can come into his inheritance without frightening the horses. But Ken as Chancellor again? At his age? With his views on Europe? That's unlikely, isn' it? Finally, I had my biggest laugh when I heard that Charles Barwell was shortlisted to become the next MP for Bromsgrove in place of Julie Kirkbride. Now I love a chuckle, chortle, guffaw etc as much as the next man, but really, this one is quite beyond a joke. Will you please stop sending me these ridiculous rumours because I can't keep a straight face any more? In a scam worthy of “The Hustle” itself, local taxpayers have given Rupert Murdoch’s daughter Elisabeth – the world’s most powerful blonde – £400,000 to make a TV series in Birmingham. In the BBC series, the team of likable rogues scam and swindle the gullible, vain and dim out of their ill-gotten gains with a series of clever, if improbable, cons. That, we must assume, is what Ms Murdoch’s production company Kudos did when they relieved local taxpayers of £400,000 via one of the region’s more pointless quangos. The quango Screen West Midlands put up one tenth of the cost of making the current series. The money has gone to a company called Kudos which makes some of the top drama series on television. Its credits include “Spooks”, “Life on Mars” and “Ashes to Ashes”. It also made “The Fixer” but you can’t win them all. Kudos is owned by the Shine Group – which is, in effect, part of the multi-billion-pound worldwide media empire controlled by Rupert Murdoch. Its chief executive, founder and owner is Elisabeth Murdoch, who is not short of a bob or two. She established Shine after signing a deal with BskyB, which agreed to buy Shine’s programming for two years. Shine has grown into the fourth largest independent film-maker in the country. Ms Murdoch is one of the beneficiaries of the Murdoch family trust, which owns 28.5 percent of News Corporation, estimated in 2005 to be worth about $6.1 billion. Shine joined the top tier of independent production companies when it bought three of its rivals, including Kudos, for a combined £65 million. The society magazine “Tatler” described Ms Murdoch as the world's most powerful blonde, beating Prince Harry's girlfriend Chelsy Davy into second place. She’s so rich and famous she got to enjoy breakfast with Barack Obama’s wife Michelle and Sarah Brown, the Prime Minister’s wife, at Number 10 when the First Couple first visited Britain. So why would Screen West Midlands give one of her companies a £400,000 bung? The quango, which enjoys a multi-million-pound budget thanks to money from Advantage West Midlands and £11.2 million of Lottery funds, claims bringing production of “The Hustle” to Birmingham has generated £1.2 million for the local economy. It also claims it creates local jobs and helps establish the region as a location for film-makers. It certainly does nothing for Birmingham as a tourist attraction because “The Hustle” is firmly set in London. Brum is heavily disguised and location shots of the capital’s skyline are regularly included so viewers can be sure of where all this is supposedly taking place. It may be that some of the cast and drew, which includes stars Robert Vaughn, Adrian Lester and Robert Glenister, have spent some money in the region. But the crude calculation that the 100 cast and crew generate £1.2 million of economic activity in 12 weeks is just guesswork while the £400,000 is hard cash. Sarah Arnesen of Screen West Midlands claimed a while ago: “We are effectively investing in the worldwide exploitation of the series by Kudos. I asked Sarah Arnesen of Screen West Midlands if it would rake off a share of the profits. I still didn’t understand so I asked: Does that mean the quango expects to make a 10 per cent profit on its investment over the next two years – turning £400,000 into £440,000? The answer seems to be no. What Ms Arnesen said was: “Screen WM is a not for profit organisation and therefore all returns on any investments made through our Advantage Media Prodcution Fund are ploughed back into the fund and used for subsequent investment in future film and TV production in the West Midlands. Screen West Midlands is run by Suzie Norton, an ex-TV reporter and parliamentary lobby correspondent. The Taxpayers’ Alliance revealed last year her expenses are running at just over £1,000 a month and include membership of the exclusive, invitation-only Ivy Club in London. Over £5,000 went on meals and drinks as part of “business entertainment” and almost £900 on taxi fares as Ms Norton was whisked to premieres and international film festivals, lunch meeting after lunch meeting and dinner meeting after dinner meeting. Aside from Ms Norton’s personal expenses, Screen WM spent £23,500 entertaining last year. So their profit on “The Hustle”, if it materialises, will more or less keep the staff in the manner to which they have become accustomed for about 12 months. And, despite reviews in the local and national press, a huge amount of publicity due to the controversy surrounding it and £380,000 of Screen WM “investment”, the taxpayer-funded movie “1 Day” grossed a meagre £44k on its opening weekend at 80 cinemas nationwide. Worse, people in Birmingham haven’t even had access to the film as all of the city’s cinemas chose not to screen it after a warning from the West Midlands Police that it may provoke clashes between rival gangs. Perhaps Ms Norton spent too long rubbing shoulders with MPs and thinks it’s OK to spend taxpayers’ money like it’s going out of fashion (which it is). Maybe that’s why bunging a few hundred grand to the one of the world’s biggest media empires is par for the course at a quango where money’s no object. If David Cameron’s “localism” policy does not apply to his own constituency parties, how can we have any faith in its wider application under a Conservative Government? The central control of candidate selection, which has become tougher as the General Election approaches and various “safe” seats are vacated by their MPs, gives the lie to localism. The experience of one constituency’s selection committee is a fine example of how the party bullies, browbeats and berates its volunteers into submission. A four-man CCHQ team led by party chairman Eric Pickles and including vice chairman John Maples, who is in charge of the candidates’ committee, met the four men and two women from South Staffordshire on Thursday. The party chairman, whose attitude was described as highly unpleasant from the start, questioned every name on the South Staffordshire shortlist of six. Starting with the mandatory three women, Mr Pickles demanded reasons for every selection and offered up his own substitutes. After some debate, the first five names were agreed without any change to the original list. At this point, Mr Pickles tried to close the meeting. “Have we finished, then?” he asked. There was a long pause before it was pointed out to him that one other name was on the list. “You don’t want him,” Mr Pickles immediately told the association representatives. There followed a long argument. The CCHQ team (untruly) claimed the controversial candidate had even threatened to sue the party at one point. The locals went through several reasons why they wanted this candidate included. They even drew Mr Pickles’s attention to a letter he had recently sent the candidate assuring him he was still on the list of approved candidates and he was free to apply for any seat where there was a vacancy. Mr Pickles ignored this completely, insisting that the person the locals wanted to invite for an interview was simply unacceptable. Did they really want someone so controversial for their sleepy backwater? he kept asking. The two sides reached stalemate. The locals called for a 15-minute adjournment to discuss the situation alone. At this point, they agreed to give way. Most of them had never been to CCHQ before, they had never met the party chairman before, they were intimidated into submission. They reluctantly agreed to drop their preferred candidate. How do I know all this? Because I was that candidate. I had personal assurances from at least three of the selection committee that they were determined to give me the opportunity of an interview. Since I resigned as the candidate for Halesowen and Rowley Regis following a storm in a teacup over an article I wrote on immigration, I have stayed loyal to the Conservative Party. John Maples, who has in the past described himself as a friend and told me I would make an excellent MP, advised me to hang on in there and in time I would be welcomed back. Mr Pickles made it known in the summer that he would welcome it if I applied for the vacant seat of Dudley North. I did so and was originally shortlisted and given a date for interview. Two days later the selection procedure was suspended. I had to reapply and this time I wasn’t successful. Was my name vetoed by CCHQ? 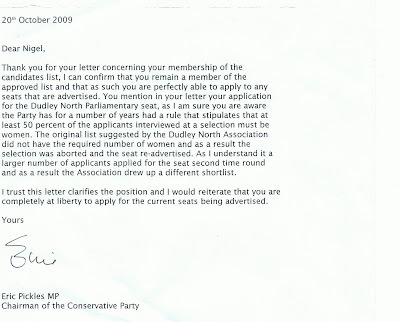 I wrote to Mr Pickles who replied that I was still on the candidates’ list and I was entitled to apply. Only now do I realise how disingenuous this was – you can apply any time you like but you won’t get anywhere. John Maples’ role is particularly obnoxious. My wife works in his constituency office (actually, she used to work there but resigned in disgust). He has told me more than once that he would like to see me find a seat and that the Commons needs people like me. One word from him could have changed the outcome but, throughout the whole meeting, he said little or nothing, certainly nothing supportive of his supposed friend. There are plenty of Conservatives who think I am beyond the Pale because of the controversy surrounding my observation, in 2007, that Enoch Powell was right to warn that uncontrolled immigration was changing the country dramatically. There are plenty more, however, who realise the truth of what I said, note that the view is now more or less commonplace, and believe a few MPs who have some independence of mind would be quite a good idea in the next Parliament. Clearly, the balance of opinion is not going to be put to the test by offering members in any constituency an opportunity to decide whether or not I should be their MP. Instead, Mr Pickles, Mr Maples and their apparatchiks prefer to ride roughshod over such concepts as local democracy. It is a disillusioning process. Those harangued by the party chairman came away shocked at their treatment and dismayed by the heirarchy’s apparent contempt for their own most active volunteer members. It’s tough luck for me, of course. But it’s even worse for the future of the Conservative Party. Why bother to become a member when CCHQ’s version of localism is to show its contempt for the locals? The most glaring example of this is, of course, John Maples’s own resignation from Stratford on Avon, which came so late he deprived his local association of an opportunity to advertise the seat and choose its own short-list of candidates. If the party’s own members can’t trust its leaders to behave honourably, why should the voters? It's interesting to note, by the way, that one of the six who made the shortlist is a strong Europhile who has in the past campaigned to scrap the pound. An e-mail received from a friend: Re;ConHome - you did not embarrass the Party - Caroline Spelman and the other weak cowards who hounded you for speaking 100% fact and common sense instead of fighting the PC-biased media embarrassed the Party. Incidentally, friends tell me they tried to post in support of you on ConHome and either their email addresses are being blocked or the site is restricting positive comments. They could all have dodgy PCs but I doubt it! Looking at the news any day in the last week, it is 100% and undeniably correct that Enoch Powell was prescient beyond belief! The vast majority of the voters would agree with you. Ever wonder why the Government needs so much of your hard-earned money? It doesn’t all go on schools and hospitals, you know. Some of it goes on “increasing the profile of trees”, giving new “groupings” of councils a “kick start” and “scoping” a workplace health and well-being strategy. When our civil servants aren’t busily employing consultants to carry out a “Regional Habitat Regulations Assessment”, they’re attending meetings of about the Offa’s Dyke Regeneration Strategy Study. I’m not making this up. This and much more is contained in a report by Olwen Dutton, one of our quango queens, who is chief executive of the soon-to-be-disbanded West Midlands Regional Assembly. By mistake I had a look. I couldn’t put it down. It’s certainly not a right riveting read – it’s written in a language only bureaucrats understand, all about key partners, stakeholders and sustainable developments. What’s hideously fascinating, though, is what it tells us about what goes in our name. No doubt all this activity can be justified and certainly explains why our civil servants are so busy. But the economy is shot to pieces, public spending is out of control and we will be the last developed country to emerge from recession. Do we really want to employ a new “Coordinator/Facilitator Officer” to regenerate Offa’s Dyke? As for increasing the profile of “the trees, woods and forests sector”, it seems even those involved in the Regional Forestry Framework, need to be reminded of its achievements to “re-enthuse participants”. Still, at least we’ve got sub-regional focus groups trying to “engage the various Traveller communities across the Region” supported by Gypsy and Traveller History Month and £2.5 million to pay for new camps. You’ll be pleased to hear the Kick Start Partnership “continues its roll out of the programme of expansion with new groupings of local authorities joining in order to improve the efficiency of service delivery”. It’s just such a pity HBoS cancelled its financial support. Hidden in this report are serious threats, however. In among the waffle about the “Sub-Regional Housing Market Area Partnerships” it seems the green belt is up for grabs. When they’re not “monitoring of the regional housing pot” or working on the “West Midlands Regional Climate Change Action Plan”, they’re employing more consultants. One lot are “up-dating” the Regional Flood Risk Appraisal – you’d have thought someone might have done that two years on from the last serious floods. Still, at least the Regional Environment Group is proposing to respond to the Severn and Humber draft River Basin Management Plan consultations and input into the new Regional Landscape Partnership. This seems to have something to do with “the requirements of the European Landscape Convention” whatever that may be. And engineering consultants Mott Macdonald are studying “the present state of the green belt within the West Midlands”. This is “the first stage of a process to consider how more positive uses of Green Belt could contribute to the achievement of the West Midlands Regional Spatial Strategy and its aims for Urban and Rural Renaissance”. Think we know what that means – they plan to build all over the green belt. Well, you don’t employ an engineering and development consultancy to report that the Green Belt should be protected and preserved at all costs, do you? More consultants are carrying out a “Regional Habitat Regulations Assessment” and another lot are developing a “Regional Historic Environment Strategy”. With all this going on, it’s just as well we’re getting “the first Waste Infrastructure programme in the Region which has set up a Waste Infrastructure Board”. Talking of waste, bids for EU money – that is, our own money minus fifty per cent – are being planned and West Midlands in Europe is “examining best practice in integrated strategy development and delivery”. Luckily, we’ve got someone on the EU Committee of the Regions Automotive Group and Advantage West Midlands is bidding for a “Knowledge Innovation Community that would give the region the potential to act as a catalyst linking key climate change developments in the region with EU regions and cities in the same field, focussing particularly on domestic housing and transport”. As if that wasn’t enough, the Health and Well-being Partnership’s “strategy” has an action plan. This includes 2,370 physical activity sessions, 1,100 mental wellbeing sessions, 540 healthy eating sessions, 490 professionals engaged in training activity, 400 partner organisations contacted, 150 volunteers, 110 sessions relating to consultation, research and scoping activities and 9,000 beneficiaries. Wealth and Health conference” and “looking at the overarching issue of project sustainability” – which in English means they’re worried where the money will come from in future. And there’s an EU human rights project to work on which will cost someone about £500,000. It’s difficult to tell what most of these projects and initiatives are about because nothing is written in English. It’s all in Quangoese where words mean whatever they want them to mean. What this brief descent into Quango hell does prove, though, is that there is lots going on. The real issue is what would happen if they just stopped doing it. And the answer is, I’m afraid, that nothing would happen. Nobody would notice. None of us would be any worse off. Committees, reports, consultancies, appraisals, workshops, partnerships and the rest of it are substitutes for actually doing something. They give an impression of dynamic activity. And nothing happens. Nothing ever happens. It’s Waiting For Godot in real life. Nobody likes a rat. Even if Patricia Hewitt and Geoff Hoon had managed to oust Gordon Brown as Prime Minister, it wouldn’t do the Labour Party any good. Voters recoil from this sort of in-fighting. And they react badly to the opportunistic desperation of a Labour Party wanting a leadership contest now. We are just over three months from a General Election. The country is at war. The economy is on its knees. The public finances are in their worst state since the Battle of Waterloo. Yesterday our top Cabinet Ministers devoted their time to debating whether to knife their leader. Willing to wound and yet afraid to strike, they bottled it yet again. But the damage to Labour has been done. Voters are already cynical about politicians of all parties. Plots against Mr Brown only make matters worse. Neither Ms Hewitt nor Mr Hoon is a political heavyweight. But when everyone knows Gordon Brown is leading his troops to disaster, Labour MPs will clutch at straws. Part of their problem, though, is there’s no obvious successor waiting in the wings. The top ranks of the party are riven with jealousies, back-stabbing and in-fighting. That’s why it took most of the Cabinet several hours to voice any support for the Prime Minister, though none of them could bring themselves to use Mr Brown’s name. Lord Peter Mandelson feels used and abused. He’s sulking because he wasn’t made the EU’s foreign secretary and he has fallen out with Gordon Brown over spending cuts. James Purnell walked out of the Cabinet last summer but nobody followed him. Alistair Darling doesn’t talk to the Prime Minister any longer. Ed Balls thinks he should become leader but nobody else does. David Milliband is already preparing to fight for the job – though whether he’s told brother Ed is debatable. One compromise candidate may be Alan Johnson, the former postman. Another is Jack Straw. The sisterhood of Blair’s ageing babes may give a boost to Harriet Harman as a contender. With so many names being bandied about, the chances of Labour finding one who can unite the party and lead it to election victory in a matter of weeks are zero. In the meantime, the jockeying for position, trashing of opponents and spilt blood generates nothing but contempt for the whole rotten lot of them. Just when Labour supporters thought the looming election might force the party into a show of unity, the splits appear deeper and wider than ever. This plot is a clear sign of Labour’s nervous breakdown as the riches and rewards of 13 years in power melt away faster than snow in spring.